Several years ago, parents and local businesses helped us to create a sound garden using recycled and reclaimed materials. This fits our ethos of working with parents and being ecologically conscious. The children enjoy experimenting with the instruments, making and changing sounds. This area has recently been adapted to improve the Brambles' garden. We still have some of the instruments, but have also added a 'mud kitchen' and a water wall for the children to explore! 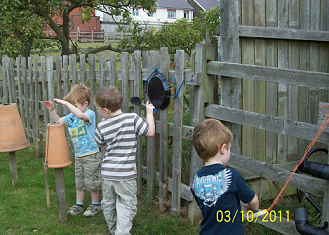 We are currently planning to develop a new outdoor sensory area which will include things to hear, see, smell and touch! Our water walls, designed and made by one of the pre-school staff, use recycled materials in an innovative and inspiring way. Children are able to pour water into various parts of the water wall and observe the course it takes, developing their fine motor skills, an understanding of gravity and the flow of water, and the ability to make predictions. We have several water walls in the outdoor areas of different rooms. A picture of the pre-school water wall in use was chosen for 'star photo of the month' in Nursery World magazine, winning posters and books for the children! Our new mud and sand kitchens have also been extremely popular with the children, who have been enjoying mixing up lots of different 'meals'! The Willows have a sand kitchen, the Brambles have a mud kitchen and the Pines pre-school have their own digging patch in the adjacent forest school area.